Streaming media made easy – or so it seems. Depending on your smartphone or tablet of choice, there exist any number of ways to share your media and files to other devices – whether it's using AirPlay or HDMI output to mirror video, apps, and photos to a television, or even just a dock or audio jack to play music through a home or car stereo. Heck, even Dropbox or email could suffice for document transfer. For users with multiple phones or tablets, particularly those from varying makers or with different operating systems, it might be a hassle to juggle the myriad ways to accomplish such tasks, big or small. It's in those cases that bCODA's Jak Multishare USB dongle aims to fill the void as an easy-to-use, all-in-one solution. As a small USB stick no larger than physical flash storage, the Jak can fit snugly into any television, computer, or home or car stereo with a USB port and be up and running within moments. The Jak creates a Wi-Fi connection that can be accessed with the free Multishare Jak app for Android, letting you create playlists and stream audio, video, photos, and documents to the receiving device. While also primed to work with iOS devices, that app is not yet available; a February launch in the App Store is expected, according to the company. At least on Android, bCODA says that up to 20 different devices can be connected to the Jak, allowing many local users to fire up playlists and alternate between them, if desired. Indeed, the Jak succeeds as an extremely straightforward, plug-and-play peripheral, allowing users to tap into content within moments using the dedicated app. Some odd limitations and an awkward app make it the kind of jack-of-all-trades device that is ultimately a master of none. Only the Android app (Multishare Jak) is available at present, and we tested it using a Nexus 7. With the dongle plugged into your destination device and its light flashing at a regular interval, you can tap the Start button to begin the pairing process. From there, you'll select the Jak from the list of local Wi-Fi networks that pops up, and once chosen, simply enter the default password from the instruction manual and the devices should be paired. 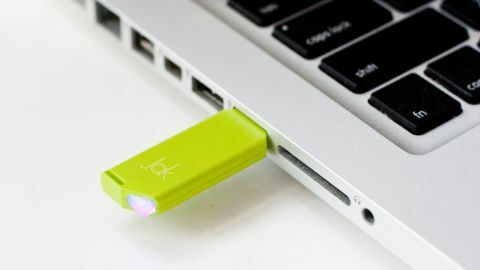 Your television, computer, or stereo will recognize the Jak as a normal USB stick, and access the media selected within the app as though it were stored locally on the device. Jak can only access the files listed on the active playlist made within the app, which must be specifically built for audio, video, photos, or documents, respectively. That means that rather than allowing you free reign amongst the files on your device, it'll only show those that you added to a specific playlist. Playlist management on the Android app proves cumbersome, as well. When creating a music playlist, you can sort the available files on your device by modifiers like album or artist, but you can't add an entire album or every track by an artist; the songs must be added individually all the same. And swapping between playlists can mean having to fully reload the media browser on your TV, for example. And we were only able to use the files that we manually added to the device via computer; the Jak would not recognize videos and songs purchased from Google Play and saved to the device, which severely limits the potential uses of the dongle. We'll have to see if similar restrictions are in place for iTunes media when the iOS app launches. Plugged into the USB port of an LCD TV, we fired up a music playlist on the app and it took between five and 10 seconds on any first attempt to start the music. But from that point on, the playback was largely stellar, with only very rare and brief pauses. Gapless playback isn't an option, sadly, and you'll encounter about 2-3 seconds of wait time between tracks on a playlist, but the audio quality is otherwise fine. Switching to video, it took a bit longer to load the first clip on a playlist – sometimes upwards of 20 seconds – but playback was generally very good, even with 1080p clips. An occasional early pause would leave the video hanging for several seconds, but it wasn't a recurring issue in our testing. With the screen of our device activated, we enjoyed quality music and video streaming with rare interruptions, even while moving around the room with the tablet in hand. However, playback becomes inconsistent with the screen turned off. The range drops considerably in such scenarios, plus pauses are more common and it can take longer to start songs. However, we were able to attain pretty steady playback with the device right near the dongle and the screen turned off. It's a risk, though, and we'd recommend putting the screen timeout option on max and tapping the screen every so often during use to keep it awake. When used with a computer, the Jak shows up as an external drive containing only the media files or documents on the playlist, which makes it a lot less effective than simply hooking your tablet or smartphone up via USB. Sure, the Jak allows access to Dropbox files via Android on your computer, but any modern PC or Mac should be able to do that rather easily on its own. Document sharing just isn't a particularly essential part of the equation; we'd rather email files to ourselves rather than pull out the Jak and have to create a playlist. For Android users that don't have HDMI mirroring available for their device, or those seeking a USB-specific option, the Jak Multishare USB functions as a simple replacement that works with a wide array of phones and tablets. Playback of audio and video via the Jak is solid across many different devices. It's simple plug-and-play interface and compact design make it an easily portable solution. The Jak is not as smooth or reliable as a hard-wired solution, and having to create dedicated playlists within the clunky app is a drag. The lack of support for media downloaded from Google Play is a big restriction that could kill the Jak's appeal for some, as well. We see the Jak as something akin to those cassette-based adapters that allow users to listen to portable MP3 or CD players on older car stereos: it's a simple and straightforward solution to a need, albeit one that comes with a drop in quality. Considering its limitations, the Jak's $69.99 price point seems steep for an imperfect means of getting media from one place to another.